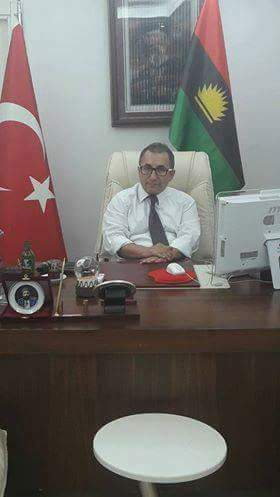 A Turkish Diplomat, Abdulkadir Erkahraman, has warned the Nigerian president, Muhamadu Buhari, to stop killing the people of Biafra but rather go on negotiation table with them. He described Buhari as "crazy" for deploying soldiers to the South East, especially to Nnamdi Kanu's residence where soldiers, on the 14th of September, 2017, broke into, attacked so many people and abducted Nnamdi Kanu's father with many others(dead and alive). In a 5:54 minutes video posted on his Facebook page on 15th September 2017, the diplomat who had recently visited the leader of the Indigenous People of Biafra (IPOB), Nnamdi Kanu in his country home, Afara-Ukwu Ibeku in Umuahia, the Abia State capital, called Buhari an "Idiot" for killing Biafran people . He cursed Buhari telling him that terrorists, Boko Haram, would soon attack him (Buhari). The diplomat blasted Buhari telling him that Islam is not a religion of violence as he (Abdulkadir Erkahraman) is equally a Muslim. He equally asked Buhari to quote which verse of Koran authorized him to kill Biafrans. He reminded him that Biafrans are peace-loving people and have wanted roundtable talks (negotiation) instead of violence but Buhari has given them war hence he(Buhari) should be ready for Biafra Army as they would crush him in no distant time. According to Erkahraman, “Buhari, I am calling you from Istanbul, Turkey. Stop killing the people. Are you crazy? You idiot, crazy man. What are you doing? What kind of religion do you believe in? Is there any chapter in the Quran that says you should kill the people? You have to stop killing the people or how are you going to stand in front of your God in the hereafter? “I’m telling you on behalf of Biafra, stop killing the people, I’m also a Muslim it’s not allowed, 500 hundred Biafrans killed and you said they are our nation. Let me tell you the Boko Haram terrorist will come and kill you too one day. You are eating and drinking the blood of your national, you are an idiot. “The Army of the Biafrans are coming and they will fight you. The Biafrans are saying they don’t want to fight, they want to negotiate but you are killing them, how old are you now, you will die very soon, you crazy man. “I will say it again stop killing the Biafrans, they are also humans. You idiot, why are you afraid to talk to this people? Why can’t you sit with these people at a roundtable and negotiate peacefully? “Buhari, tell your dogs to stop when you die how will you face your God? “I’m saying it again, stop killing the people sit and negotiate, you are a human being with father, mother, children and so on. “If you were to be them how will you feel, they don’t have weapons, aircraft, tanks in their hands yet you are killing them with your guns, open your eyes you will die very soon, they have their lives, they are suffering. “We will show you very soon you idiot man, I’m telling you on behalf of Biafrans worldwide you will die soon and face punishment, this group will kill you one day. They are a human being like you.